At last Wednesday's alcohol forum, one of the issues students expressed was a concern that the Rice University Police Department had changed its attitude and philosophy in enforcing the policy and is now becoming stricter.In particular, students cited two incidents at Duncan College and Jones College over Martin Luther King Day weekend in which RUPD seized alcohol from public areas. 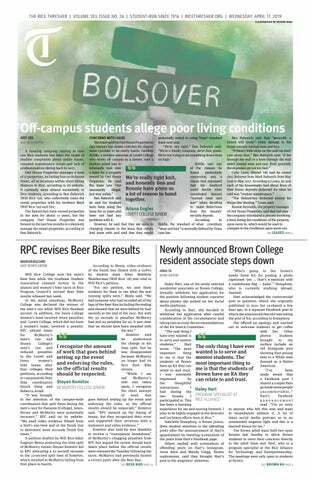 On the night of Jan. 14, there were a series of alcohol-related calls to Rice Emergency Medical Services in several of the north colleges, including Brown College, Jones and Duncan, Jones Chief Justice Kaleb Underwood said. When RUPD went to answer one of the calls at Duncan, Police Chief Bill Taylor said they noticed a disproportionate number of students - Taylor estimated 200 - in a public area of the college. Although the area was closed off by a door with a key, making some students think it was part of a suite, Taylor said that, since any Duncan key could open the door, the area was still considered a public space. The officers called Taylor to ask what they should do. Taylor came to investigate and, when he arrived, he said they found a door taped open and a large quantity of unattended alcohol. He said they confiscated the alcohol to prevent any minors from consuming it. "When I got there and saw alcohol laying out there, I [couldn't], in good conscience, leave it," Taylor said. One member of the suite, who commented on condition of anonymity, said that he had been casually drinking in the suite with friends from the University of Texas and Rice earlier in the night, but that they had stopped by the time RUPD came by around 3:30 a.m.
"They barged in and talked in a startling way," the student said. "They told everyone to get out, so we went out and walked around Duncan for a while." The student said that he and his friends had returned to the suite and were prepared to go to bed when RUPD returned and put his friends in a police car. The student said RUPD confiscated his suite's alcohol and had his friends take alcohol from another suite as well. He said RUPD also threatened his friends with public intoxication charges and, in the case of a friend from UT, with trespassing. A similar incident happened at Jones that weekend, according to Jones President Eric Friedlander, who said he returned to Jones one night and found a group of students playing beer pong in a floor lobby while another student sleep-vomited nearby. He said he called REMS and told the other students to leave and then waited until REMS arrived. Friedlander, a senior, said that, while one or two police officers usually accompany REMS, he saw five or six who kept going in and out and seemed to linger around the college even after the student had been hospitalized. Friedlander said he awoke a few hours later to the sound of keg shells being dragged along the hallway by RUPD officers. The shells, which had been in the floor lobby, had not been used for several months, according to Friedlander, who said that while they were not technically empty, they had only a little liquid remaining. Taylor said the keg shells were being held at RUPD until they were retrieved by their owners. In the situation, Friedlander said he thought the officers were probably stressed and did not know what to do, and as such, removed the alcohol from where minors could get to it. The incidents led to a meeting on Jan. 24 between Taylor, the college masters and the college presidents to discuss the incidents, particularly concerns about the seizures. Wiess College President Molly Bryan said she had several concerns relating to that weekend. "First, there were several uncontrollable private events leading to multiple transports," Bryan said. "Second, the fact that RUPD reacted in a way that didn't make sense - they were not even the location or the people who had provided the alcohol and [RUPD was] taking possessions out of a thing considered to be a room." Bryan also expressed concern that, although RUPD said they had called the chief justices at some point, the chief justices were unaware of the event taking place. Underwood said RUPD had not contacted him the night that the keg shells were taken from Jones. Taylor said he has noticed that there has been less compliance with the policy among students. He said students in recent years had not been following the policy and, because of that, his office had been compelled to respond. "When [students don't comply with the policy], it gets us involved, and when students show up doing things they shouldn't and we show up, we have to do something about it," Taylor said. "We can't ignore it." Taylor said RUPD was also working to step up its communications with students, particularly concerning public events. He said he would like for officers to meet more with student leadership in the colleges to talk about how best to plan public events and added that there were ongoing programs. "We need to have that level of interaction," Taylor said. "It works both ways. It's pretty hard for our guys to have to run to each part of the college leadership, so if we can get everyone together at one time ... we can actually do some work together." Friedlander said that he is trying to reduce alcohol incidents at Jones by getting people to be more aware of themselves. "I'm more worried about people thinking that they're kind of invincible," Friedlander said. Seth Brown and Ellen Liu contributed to this story.